2015 was such an exciting year - directing seven productions in six cities, including three world premiere productions, my first New York Times review, a Princess Grace Award, and a wedding! Whew. *Learning about ASL and deaf culture during the dual-language Mother Hicks, performed simultaneously in spoken English and American Sign Language, at Emerson Stage in Boston. *Exploring the Cleveland indy arts scene while directing the rolling NNPN World Premiere of Nathan Alan Davis' lyrical Dontrell Who Kissed The Sea at Cleveland Public Theater. *Addressing a pressing issue of our time with the powerful new drama about police violence, The Broken Record, at FringeNYC. 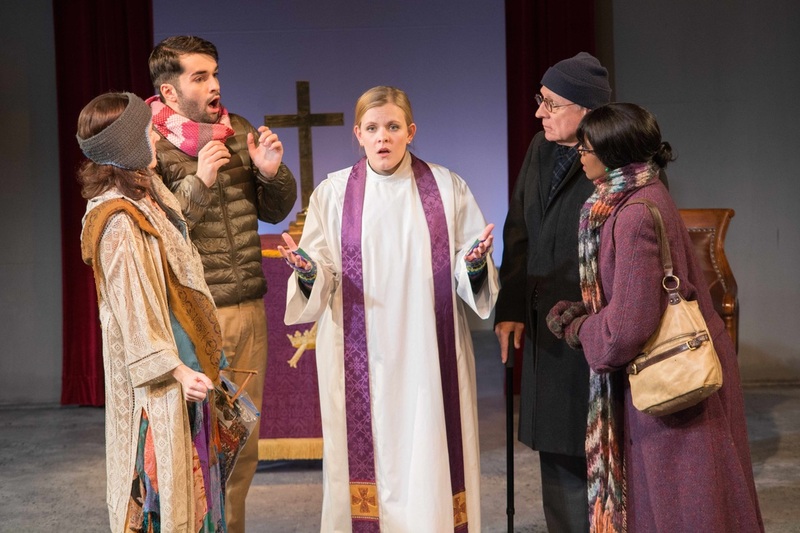 *Enjoying fall foliage in the Berkshires while directing Catherine Trieschmann's screwy new comedy about the Episcopal church, Holy Laughter, at WAM Theatre, which has a "double philanthropic mission" - 25% of ticket proceeds went to a girls education project in Nepal! *Helming the holiday heart-warmer, It's a Wonderful Life: A Live Radio Play, currently playing at Merrimack Repertory Theatre (MRT) in Lowell, MA, which is now the best-selling production in MRT history! It was my first time directing a holiday show, and I loved it so much, I can't wait to do it again. I'll spend much of the spring in residence at MRT devoted to nurturing new work with my favorite playwrights, thanks to the Princess Grace Foundation Fellowship. See below for a photo from the swanky royal awards ceremony and a few production shots from this season, as well as snaps from 2015's most magical event - the September evening in Provincetown that I got married to my wonderful partner, Candice!